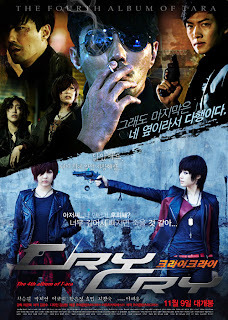 Girl group T-ara revealed their posters for their "Cry Cry" music video. On the 28th at 9:00 AM KST, the first poster for their music video was released in the form of a movie poster and shows off a scene from inside. The poster says, "Thank you for being next to me at the end" with actor's Cha Seungwon and Ji Changwuk charisma catching attention. Member Qri appears at gunpoint by Jiyeon, rising questions about how the music video was produced and news is revealed that Lee Jaeyoung makes a surprise appearance. In addition, another music video poster for "lovey-dovey" will be revealed with an 180-degree different feeling and will have a release date one week later than "Cry Cry". T-ara's 30-minute music video drama was made by the master of music video directing, Cha Euntaek, who made the visual of the video similar to that of an actual film while including an intense story. T-ara will release the video on November 9th, but will release 2 more posters at 10:30 and 12:00 in 1 1/2 hour intervals for a total of three posters being released. Prior to the release of the music video, T-ara will reveal a teaser on the 31st at 1:00 PM. Meanwhile, T-ara are practicing hard for their comeback in Korea in the upcoming weeks.